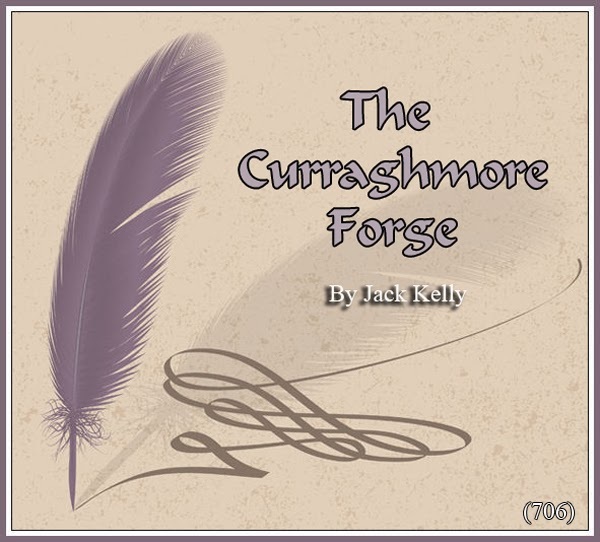 Portlaw: Still Another Jack Kelly Article! Still Another Jack Kelly Article! 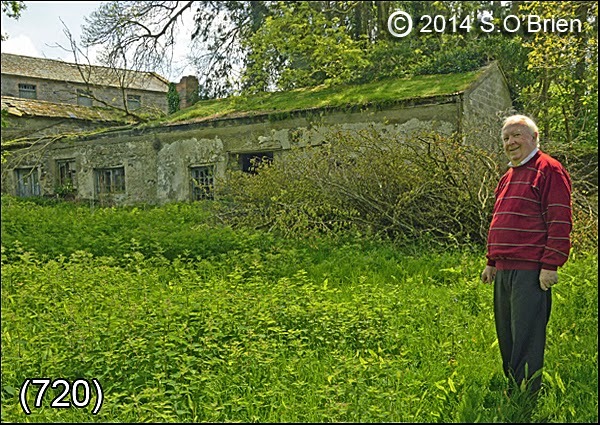 Recently Seán O’Brien posted a photograph on this site showing a gate-latch which he discovered near Mick Day’s Lodge on the Carrick entrance to the Curraghmore estate. The inscription on the latch was ‘Purser 1893’. This photo activated further memories of my youth at Farm Lodge. Seán investigated the Purser family tree and discovered a Richard Purser, who was ‘head blacksmith’ in the 1901 census, aged 31 years, and obviously the one who manufactured the gate, but also a William Purser, aged 20, who too was listed as a blacksmith. Bill (William) Purser was in his sixties in 1946 when I knew him. He lived in that large quaint house, just inside the first gate entrance to the estate, and cycled to work at the forge, just past our house near the farm-yard. Bill was a low-size man, with bandy legs and wore leather guards on his shins. He had a leather satchel strapped onto the cross-bar of his bike, to carry his lunch. Each morning he would stop and talk to my great-granny and sometimes conversation would come up about religion. She would say – “You will never see the face of God, being a Protestant! Why don’t you come over to our side?” “In my father’s house there are many mansions” Bill would reply, and move on to his day’s work. The one-time Purser residence at Curraghmore. The other blacksmith was Gussy Howley, a large rotund man with arms like trunks of trees, who smoked a pipe and had a gruff manner. In those days, blacksmiths were essential to the smooth running of the farm. They not only shod working horses, but fixed machinery, made gates and railings and handcrafted all kinds of gadgets. The forge was a hive of activity. Large lengths of iron stood by the wall. I often stood in the forge watching the men at work; a large coal fire gave off great heat and made the iron supple. A large bellows fanned the flames. Bill supplied the brains and Gussy the brawn. An anvil stood in the centre of the forge. Bill held the red-hot iron over the anvil and Gussy, with mighty blows, hammered the object into shape. Sparks of different colours and shapes lit up the dark forge like myriad shapes of tiny stars in a desert sky. The object was then cast into a trough of water and white steam filled the forge. To see horses being shod was a sight to behold. There were two main working horses named Dawdy and Charlie They were white Clydesdales, huge in size and quite by nature. Gussy usually shod the horses outside the forge. He would appear, sweat dripping from his brow, and his temper on edge. First, he would use a rasp to even out the hoof. Then, holding the horse’s leg between his own huge thighs, he would continue. If the poor horse should move his position, the air would turn blue with colourful expletives from Gussy’s mouth. Bill would say nothing, just raising his cap until Gussy regained his composure. The now-defunct forge. About 30 paces behind Jack lies Farm Lodge, the one-time Kelly residence. It is amazing how one little picture, posted on the Internet by an intrepid photographer in the present day, can create thoughts of days gone by. Well done, Seán, for activating still further memories of Curraghmore. 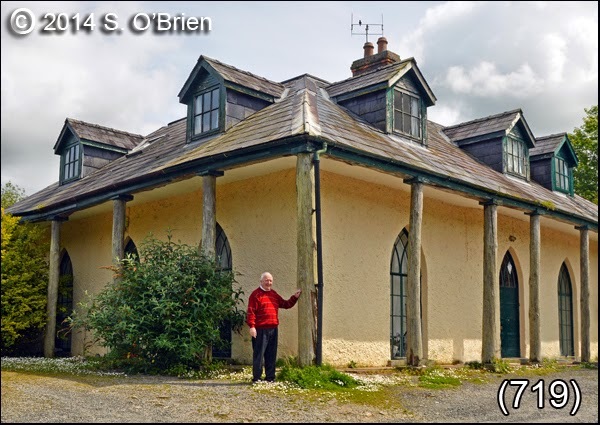 Note: A recent photograph of the forge in question was ‘posted’ on this blog on January 18th 2014, under the heading – ‘CURRAGHMORE BLACKSMITHS’. To locate the page, click on ‘Older Posts’ near bottom right of this page. The above two photos only taken, and added to the site two days ago - May 15th '14. A LOOK INTO THE PAST!